Have a question for Hyatt Place Chicago South - University Medical Center? Serving a daily hot breakfast, this hotel is located within 5 minutes’ drive of the University of Chicago campus N and 11 km south of the Loop. The hotel offers free daily shuttle service between 7am until 7pm. Free WiFi access is available in guest rooms. A 42-inch flat-screen cable TV and a sofa bed are provided in every room at Hyatt Place Chicago-South/University Medical Center. Complete with a refrigerator, the dining area also has a coffee machine. Private bathrooms also come with a hairdryer. An indoor pool and a fitness centre are available at University Medical Center/Chicago South Hyatt Place. Along with a 24-hour front desk, meeting facilities, luggage storage and dry cleaning are on site. The Guest Kitchen is on site and offers soups, sandwiches, and other snacks 24 hours a day. The Bakery Café features a full bar with dessert treats and Starbucks ® coffee. 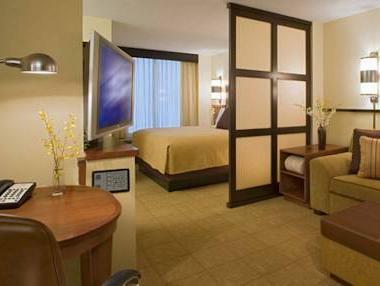 The hotel is 10.9 km from Magnificent Mile, 6.1 km from McCormick Place and 10.3 km from Navy Pier. O'Hare Airport is 33 km away. The property offers parking at an extra cost.